Oregonian: Three Portland area recipients of the UO Stamps Scholarship are profiled. The university’s story about the June 10 “signing day” event is here. Oregonian: “Lighten Your Load” recycling efforts at the UO encourage residence hall students to donate and recycle items during move-out. The Inquisitr: A University of Oregon study found that infants born severely underweight have smaller brain volume and suffer academically. AroundtheO: Alex Dracobly, history instructor, created the Veterans Oral History Project as a repository of interviews of veterans and active duty servicemen and women from the University of Oregon. AroundtheO: Will Johnson recently returned to the UO School of Law from Pakistan, where he was a lecture and research fellow with the American Institute of Pakistan Studies. 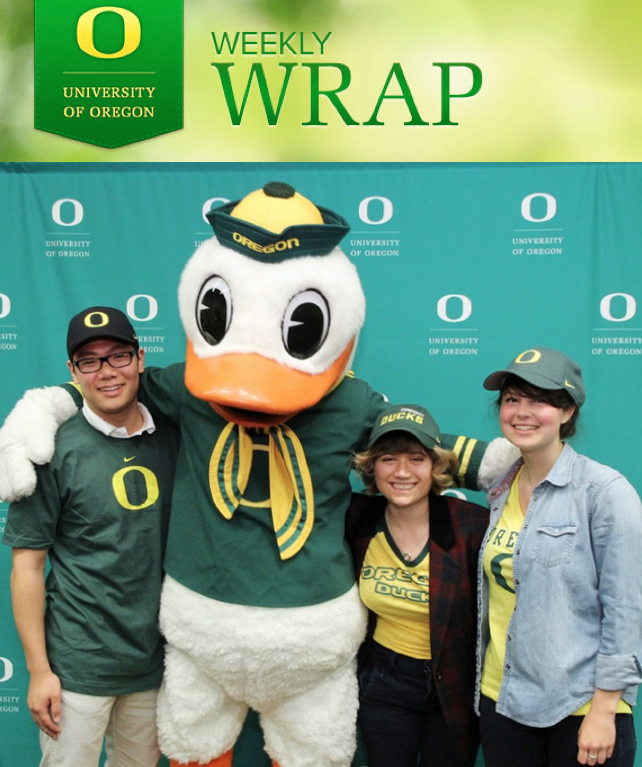 AroundtheO: For commencement on Monday, June 17, the Division of Student Affairs is encouraging all members of the university community to gather along 13th Avenue to watch and cheer on this year’s graduates in the Duck Walk parade. GoDucks.com: For the fifth straight year, the University of Oregon women’s track and field program has been named the national Terry Crawford Women’s Division I Program of the Year for its national championships in cross country and indoor track and field, and third place finish at the NCAA outdoor championships last week.